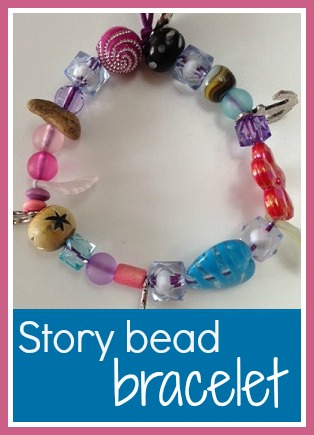 I first encountered story beads on the blog Mudpies and Marmalade - Story Beads. It's a lovely post if you are interested in learning more about them. Basically, story beads are beads which are used as a prompt for telling stories, and they can be stored as a necklace or bracelet worn by the story teller. I've been meaning to make a story bead bracelet for a while now, and I started collecting beads for it, but I'd been putting it off. I wasn't sure why at first, but then I realised it was because I was worried that I'd forget the stories associated with the beads. But I decided that it's not important, if I forget the stories I can just make up a new one! The stories can vary anyway according to the mood of the teller or the listener. Story beads are also popular for helping children to remember famous stories like the Nativity or Thanksgiving. I've also discovered Great Story Beads, which are an amazing way of symbolising a story spanning 13.7 billion years. You can find plenty of fascinating information and ideas here - Great Story Beads. I made my bracelet using some beads that I bought ages ago, and some that I received recently as part of some crafty goodies to review. The beads that I bought mainly came from the Brighton Bead Shop which I really love, I picked up some little silver charms that I like to represent certain things about me - an anchor for travelling, a feather for writing, a cupcake for baking. I was in Hobbycraft recently and noticed that they had a nice bead selection in there too, and that's where I bought the purple elastic that I used to string the beads together. Among other things, there is a little stone on the bracelet with a hole through it that I found somewhere, and an old bead that I found in the garden of our old house. I deliberately made my bracelet while the children were around so that they could see what I was doing, and of course they both wanted to make one too. Luckily I had plenty of beads! Mia was happy just stringing away, but I encouraged Harry to think about the beads that he was using. I asked him what particular beads reminded him of, and I loved his responses. He chose one that had a large hole through the middle and said that it reminded him of a rabbit because they live in holes. He chose the sparkly ones because they reminded him of pirate treasure. They are pretty cool bracelets! I've told Harry that if he sees me wearing my story bracelet then it means that I'm in the mood for telling stories so he can come up to me and ask for one. I thought that I'd find it difficult to come up with stories for the beads, but it's not hard at all. Sometimes my stories are based around things that we've done together, and the children love stories about themselves or children just like them. I've used them as a way of helping them to remember things that we've done. 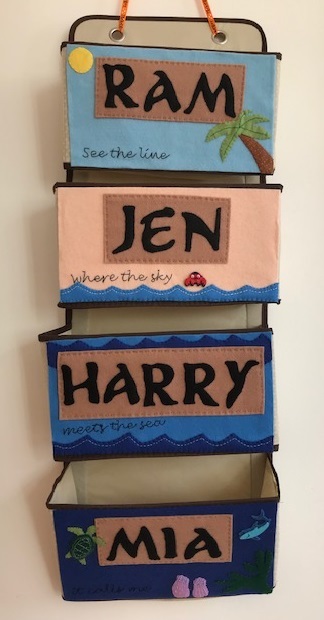 It's a similar idea to the storytelling bottle caps that I made a couple of years ago, and that Harry still asks for today. uber charming idea, as always!